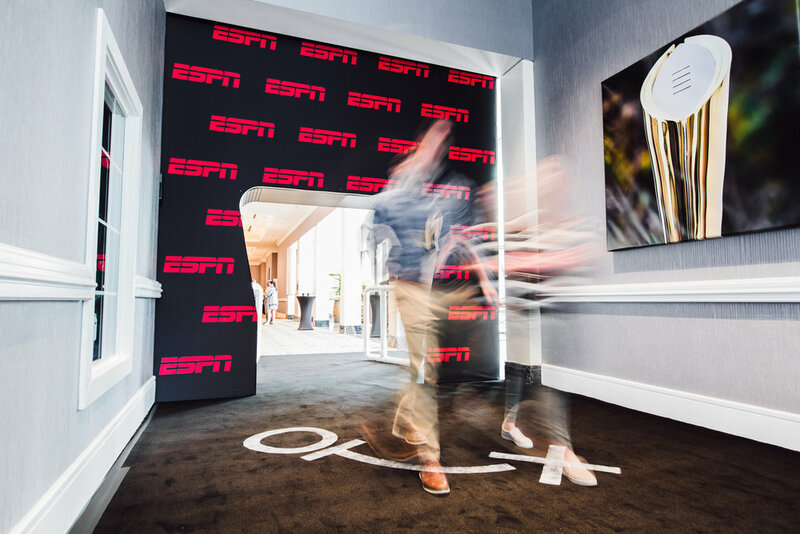 ESPN was looking to make a Texas-sized statement to the sponsors of their College Football Playoff Sponsor Summit (CFPSS) They asked us to create a branded experience to excite their attendees. ESPN specifically asked us to create something they had never seen before. Challenge accepted. We designed a branded experience that evoked all the hallmarks of a college football game. Sponsors walked through a larger-than-life football helmet on flooring marked with offensive schemes. The sponsor gifting area was merchandized in life-size football lockers. We branded the meeting space by covering artwork and sound panels in an auditorium with iconic college football game day images. No detail was left undone. The design details were a major win for ESPN. The sponsors raved about the theme and over-the-top installation. And they remarked that, in fact, they had “never seen anything like this.” That’s a win-win in our book!